Just a reminder, there is another Free Friday coupon available to redeem this Friday! 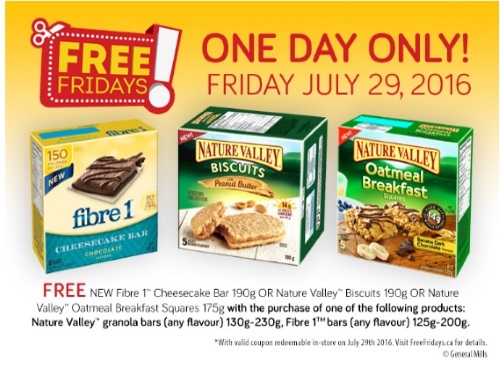 Get a Free Fibre 1 cheesecake bar, or Nature Valley Biscuits or Oatmeal Breakfast Squares when you buy a select General Mills product (either Nature Valley granola bars or Fibre 1 bars). This coupon is only redeemable this Friday, July 29, 2016. Get your coupon ready to go! Where are you going to redeem yours? Let us know on our Facebook Page. Click here for the original coupon post.